Ausgedacht, zusammengestellt, ohne Netz und doppelten Boden live gemixt von André Galluzzi. Released in a six-panel digipak. 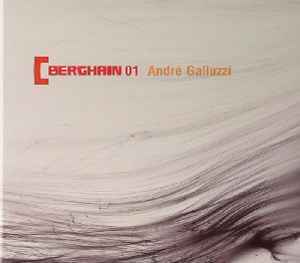 Berghain 01 came out at the peak of the minimal movement, and the quality of the tracks featured within support that notion. There is no filler and the track selection is top notch. Sure, Ame's Rej might be a little tired now, but when this was released it was still somewhat fresh. The mixing is satisfactory; I don't ask for much in that department anyhow. One of the best compilations of danceable minimal circa 2005.
easily one of the best mix cd's of the last year. went under the radar of most fans of the minimal sound, but should not be overlooked by anyone. a stunning mix by galluzzi. a wonderfully flowing mix with sprinkles of hypnotic yet creepy vocals and lush pads make this compilation one of the best out there. its rare that i find a mix cd that keeps me wanting more, but this one definitely does that to me and anyone that i show it to.